Located approximately 45 miles south of Madrid, Toledo is home to not just beautiful architecture and historic buildings, but also marzipan! 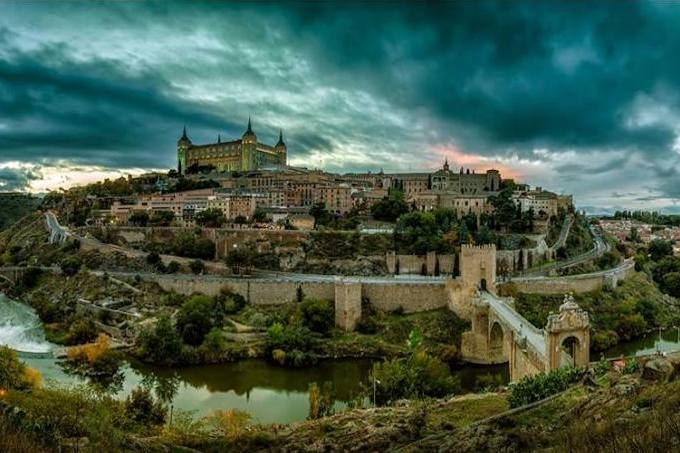 No more than a 30-minute high-speed train ride from the Spanish capital’s Atocha Station, the UNESCO World Heritage City of Toledo will transport you back to the Middle Ages, whilst also sating your cravings for marzipan! Known as the ‘City of Three Cultures‘, Christians, Moors and Jews lived together in harmony until the end of the 15th century, when the latter were expelled by Ferdinand and Isabella following the fall of Grenada. Modern day Toledo still bears witness to the various civilizations that made it one of the most diverse Spanish cities. The artistic grandeur is immediately obvious as soon as you step out of the train and discover the station designed in the Neo-Mudéjar style. Entering the old centre, which is perched atop a hill overlooking the Tagus River, you pass through the majestic gateway of Puerta Bisagra. Originally built by the Moorish in the 6th century, it was later extended in the 16th century. Dominating the city, the Alcázar (pictured above) is probably the most emblematic monument of Toledo. First used by the Romans in the 3rd century, the stone fortification has successively hosted the Visigoths, the Arabs and then the Christians. It has also been demolished and rebuilt several times and served as a Republican stronghold during the Spanish Civil War. Today, it houses an interesting collection of uniforms, weapons and war memorials. From there, the best way to get a feel for the city is to wander through its labyrinth of winding cobblestone streets. Monasteries, churches, synagogues, mosques, museums…no other place in Spain contains so many monuments of interest within such a small area, which explains why the city is also known as La Ciudad Imperial (Imperial City) and has over the centuries seduced many artists, including El Greco who spent most of his adult life there. Whilst Toledo may be a city of swords and damascene, it is also reputedly the birthplace of marzipan. Be sure to make your visit really memorable and sample this traditional sweet made of raw peeled almonds and sugar in one of the city’s many convents and bakeries. Iberia offers daily flights to Madrid from Nice airport. Feedback Time – Please Send Us Your Suggestions!